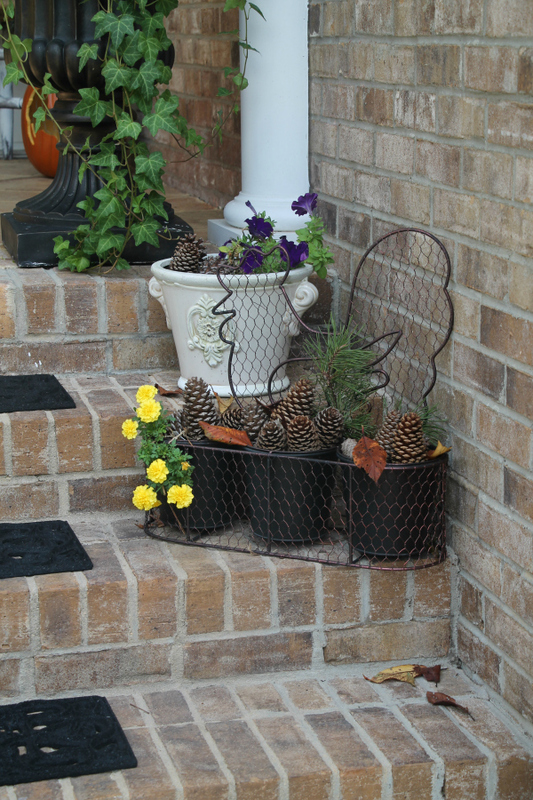 The reason I was gathering pine cones and dead leaves was so I can add them to my fall containers. You see when you are a convicted plant killer you have to think of other ways to get around your next crime. Mine was to simply not plant any more flowers for the season and gather what is in my yard. There is not much new here. Just a change of location from prior years. I did buy the owl welcome mat at Walmart, or Lowes. I already forgot, it was back a month or so ago. There are some of the pine cones and dead leaves:) Pretty soon our steps will be full of dead leaves anyhow. When it’s fall, they really fall all over here. It used to drive me mad with constant clean up. I got smarter and realized just leave it be and clean up once a week. I used to be out here and on the back porch every single day with the blower. Mums never last but a few weeks. But they are pretty while they do last. A little fake foliage for color. May be a bit tacky but it really doesn’t look too bad in the urns. 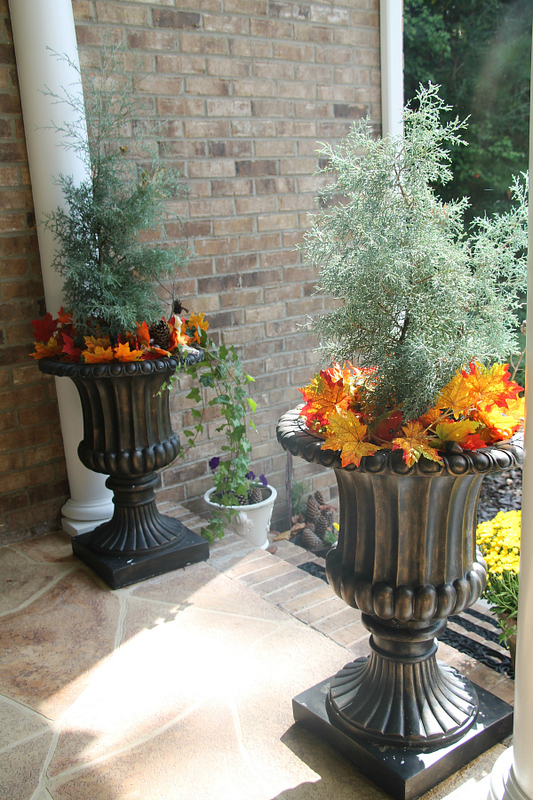 The only thing I have NOT killed in a few years are those cypress trees I planted in the urns. They must be super hardy. I barely even water them. I suppose that is why the other plants never last long DUH! They need water and some TLC. Last year I made the Farmhouse pumpkin planter. It was on the kitchen table. I moved it out here this year and it looks pretty cute. You can find Farmhouse pumpkin tutorial HERE. Someone had asked me the other day how the chalky painted rockers are holding up. They are holding up great as for the paint job. The rockers are the other hand are not. I noticed the other day one of the spindles are rotting. I suppose after 11 years it may be time for new ones. You can find the chalky painted rockers HERE. As you can see they get beat on by the sun. The paint though is not one bit faded. Looks beautiful and I would totally use that paint again for any project. My 99 cent thrift store chair is holding up well too. Just don’t sit on it. I am not sure it would hold much more than that pillow. The little pumpkin next to the chair was my very first time ever using a hot knife to carve. It was a fun little project. You can find my rooster carved pumpkin project HERE. 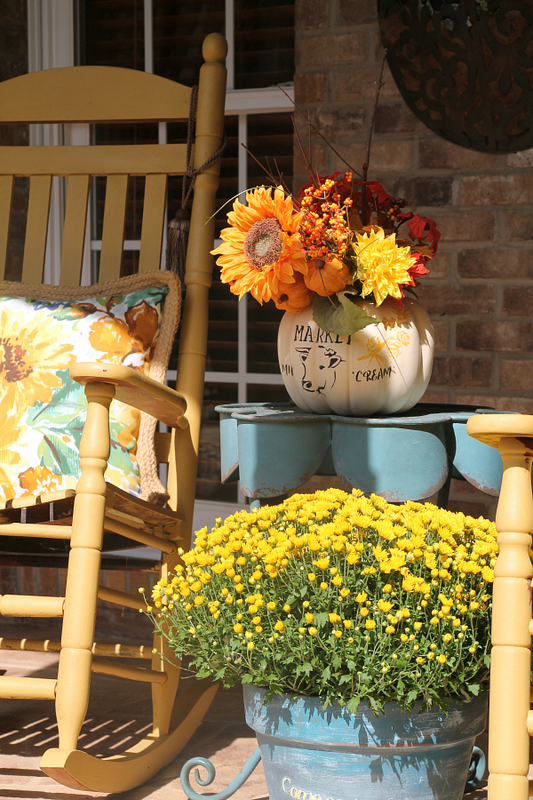 Sunflowers were this years theme of the front porch. Thanks again for stopping by. I hope I inspired some fun ideas for you on a friendly budget. 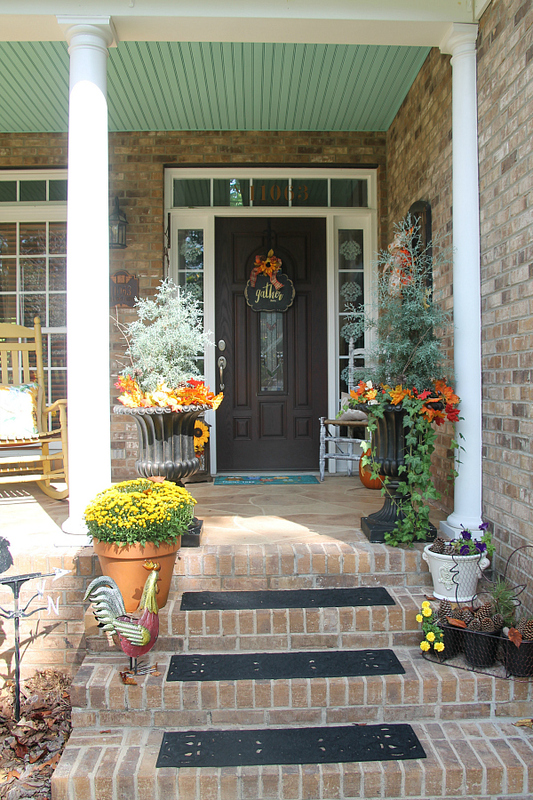 Time to go finish the window boxes with dead leaves and pine cones. I started them yesterday but want to add a few more dead elements. On another porch note. 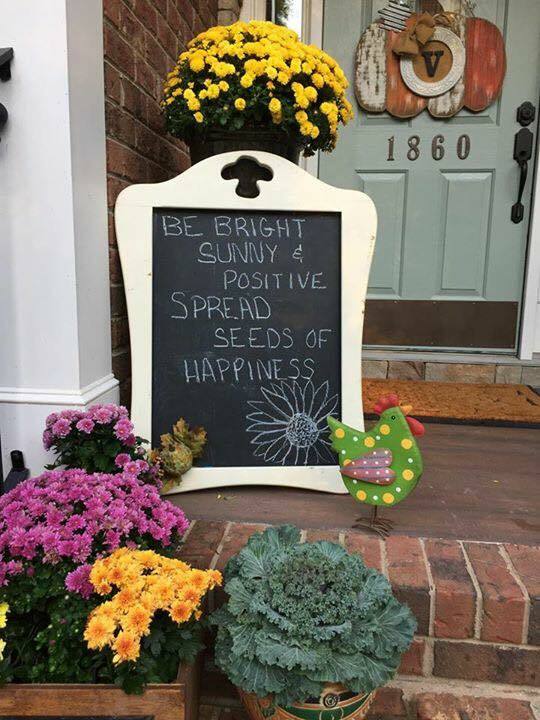 I have a dear friend who recently started a porch of positive message every day. She writes a new inspirational message on a chalkboard for all to see and take away with a smile. You just never know who’s day you will make. Let’s spread it. Now I have to get a chalkboard for my porch. Even her doggie likes it! You can find my stencils on Amazon. Farmhouse market Cow stencil HERE. 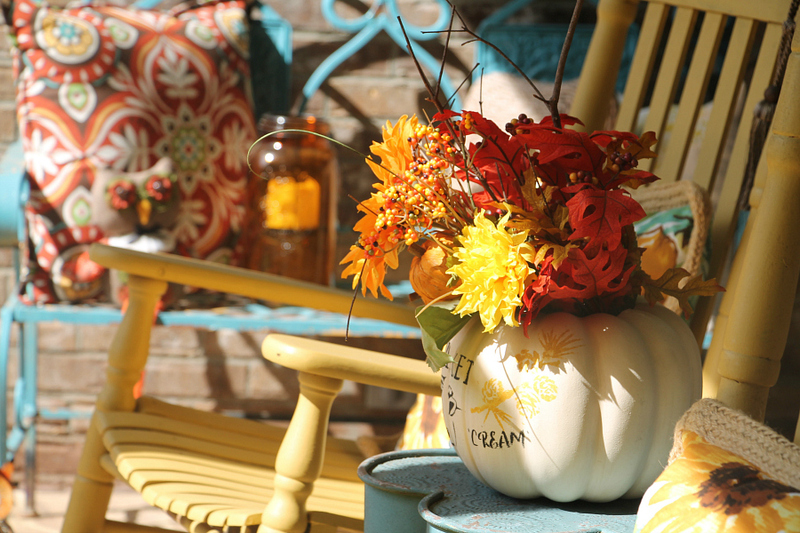 Just in case you missed the Fall Kitchen decor HERE. 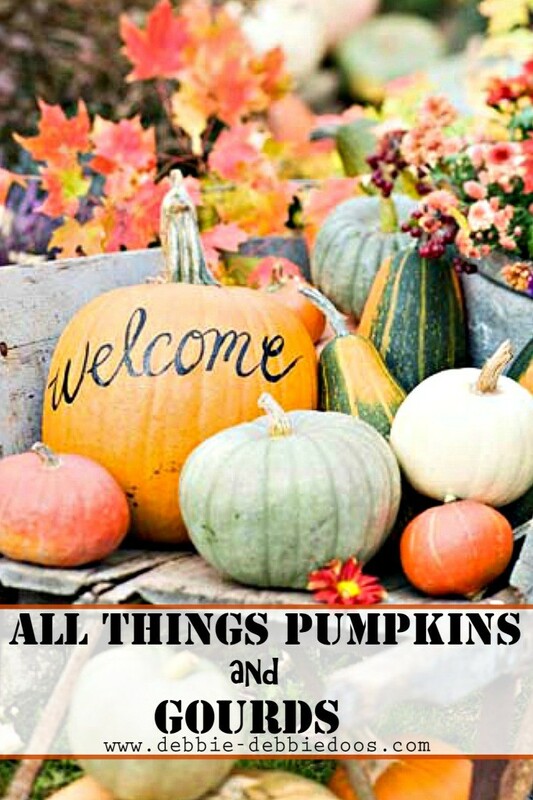 Check out All things pumpkin and gourds ideas HERE! Don’t forget you can catch me over at Home Pressure Cooking! I just made a killer dump cake in the Instant Pot. It was an experiment and it totally worked! I love your sense of humor!!! Humor gets me thru the day in a very stressful life. If I lived in your area, I would love to share a cup of flavored coffee or some peppermint tea on your porch. Have a blessed day!! 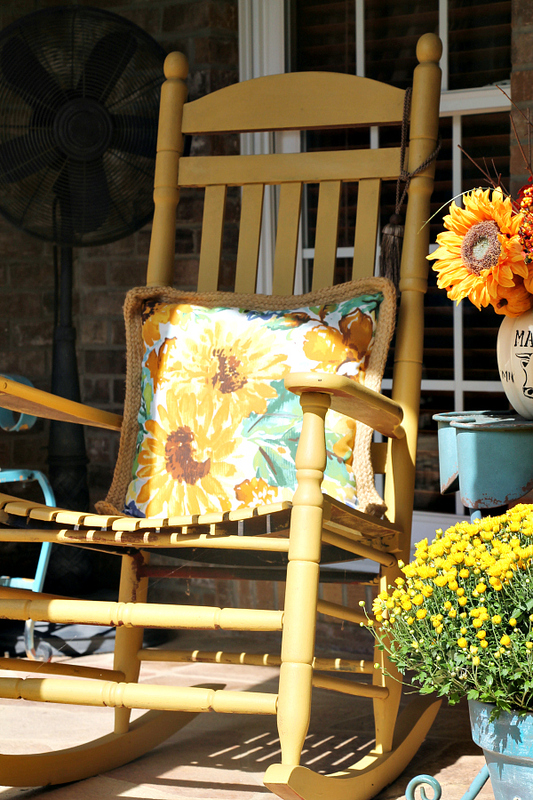 I love your sunflower themed porch! It looks so welcoming. 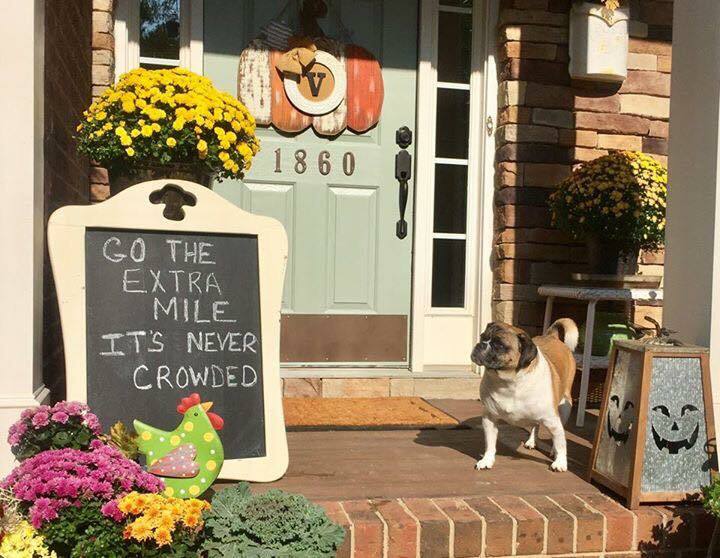 I started to decorate mine but I’m holding off on getting mums until we get back from a trip. They need a lot of watering! 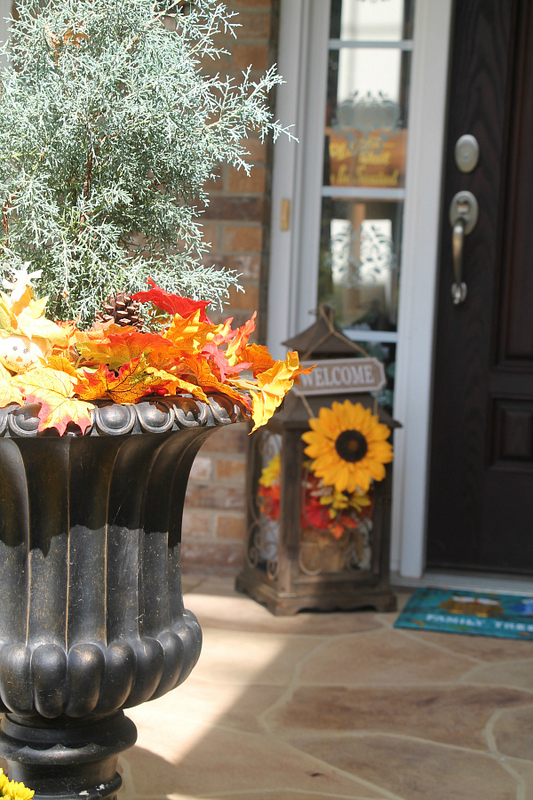 Fall looks great on your porch!! 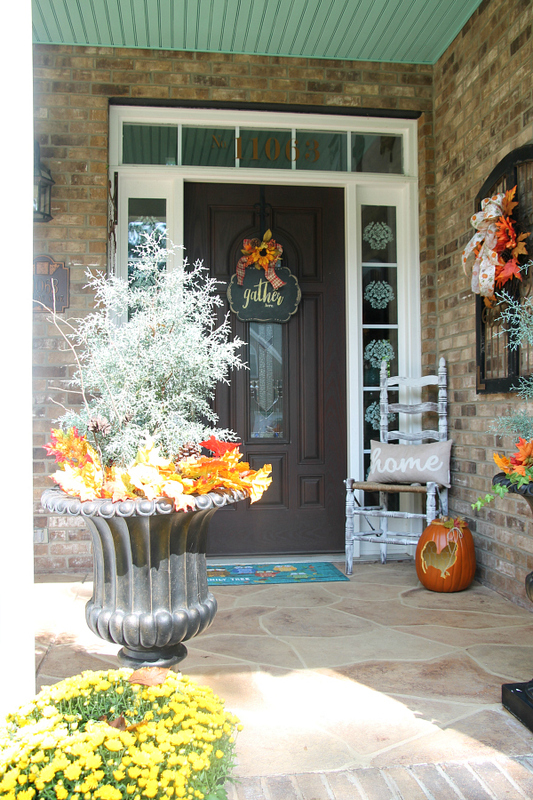 I always love your fall porch. I absolutely love your petal shaped table. Sense of humor still intact I see! 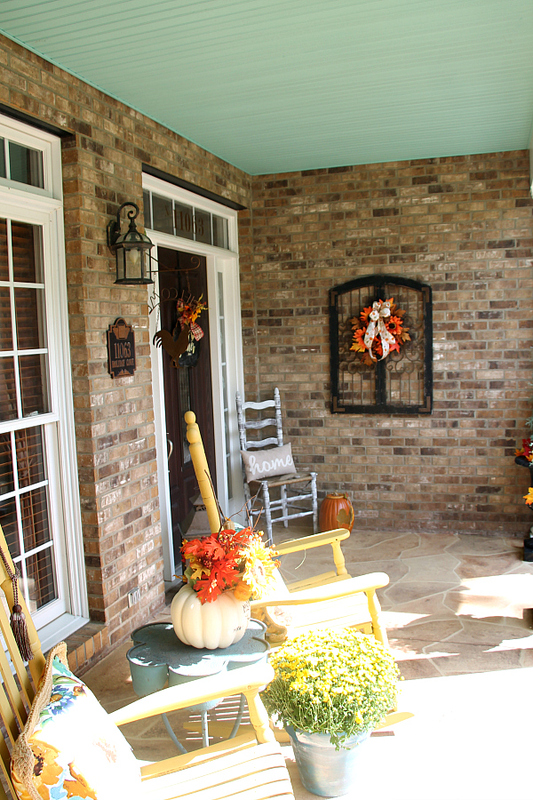 LOL Porch looks so inviting! As usual Debbie you did a wonderful job! 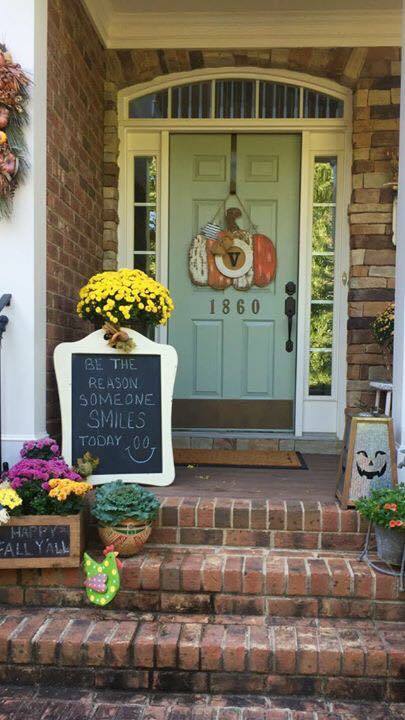 Love your porch and also your friend’s message! I live in the Pacific NW and I find the Fall Asters last longer. I dug mine out during the summer and did not get a chance to replant it yet. 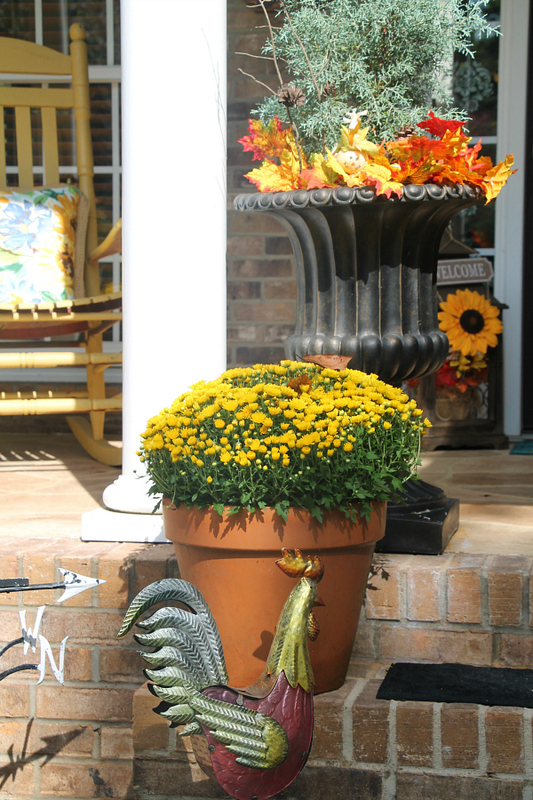 I looked in the bucket full of water and there it is in full bloom…..
Debbie, I love your porch!! It is so fallish!! It’s been a long time since I have been involved in blog land. Trying to catch up a little. I watched you live on FB doing a yummy meal and it was truly inspiring! You are so cute! We no longer live in Utah. We moved back to VA. A new house is in the works. I will drool over yours in the meantime. WOW Holly, lots going on with you. Glad you are well. Best wishes to you and the family. 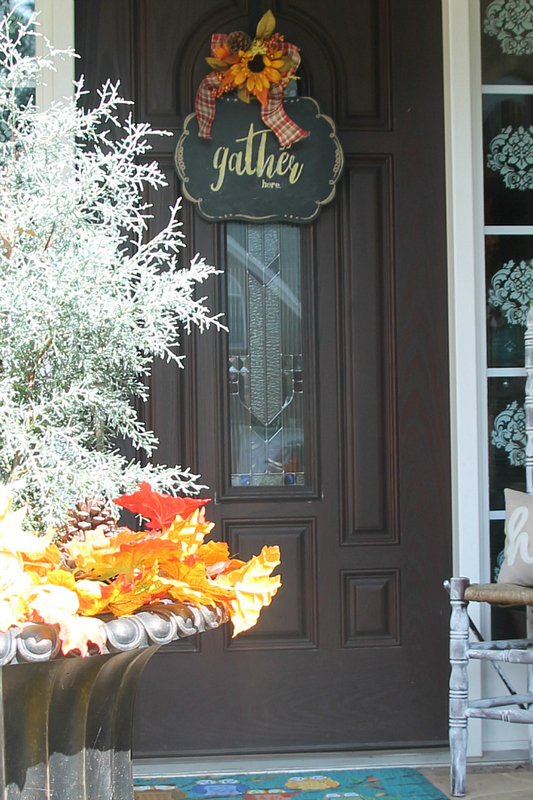 I always look forward to your Fall porch displays and love how you incorporated your stencil designs into the porch decor…happy fall Debbie!